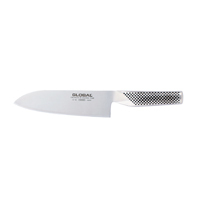 Global Knives are easy to use, razor-sharp and exceptionally light. 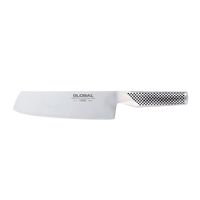 Knives from Global are unique in the world of fine cutlery. 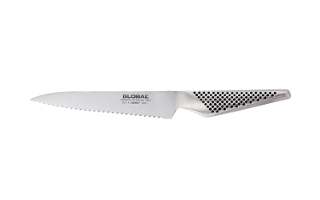 The stainless steel used in a Global knife is harder than the steel used in traditional German cutlery. 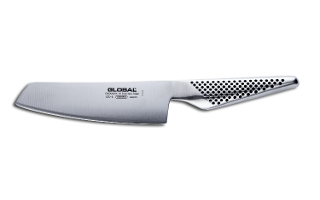 Global knives stay sharper longer. 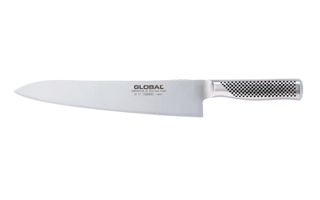 Global cutlery is also much lighter than many top quality knives because of strong, thin blades balanced with comfortable handles. 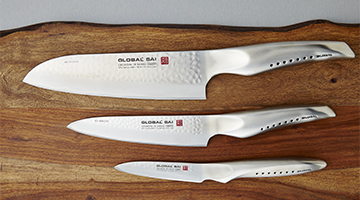 Confidently select Global knives, backed with a lifetime warranty from Global cutlery. 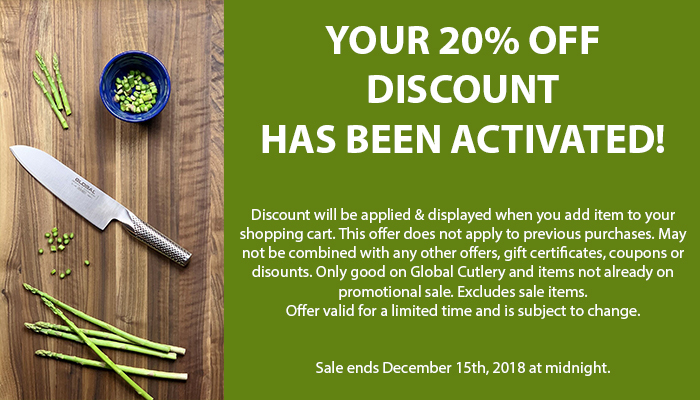 A professional presentation and organization of your Global knives plus extra value over buying by the piece. 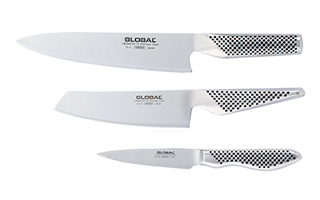 Boxed sets make excellent gifts, and are also an economical way to begin or add to your collection of Global knives. 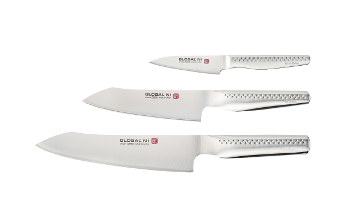 Global Sai knives are the newest line of high-quality cutlery from Global. 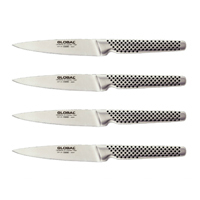 These knives feature a new hand-hammered blade and a 3-layer construction for better edge life and performance. 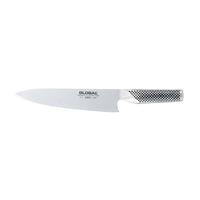 The Japanese Santoku Knife is great for chopping, dicing, and even carving or slicing. A must have for your collection. 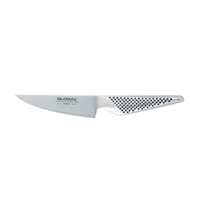 The Chef's knife, often called a Cook's knife, is the workhorse of the kitchen. 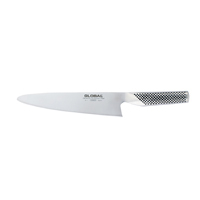 Perfectly balanced for effortless chopping, mincing, and dicing, this is the knife the professional chef reaches for most often. 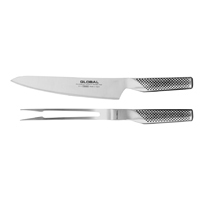 These premium steak knives are both functional and an elegant addition to your table. 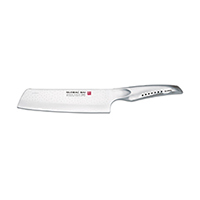 For intricate tasks requiring precision and control. 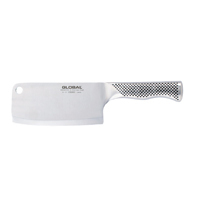 Used for paring, trimming, coring, and dicing fruits and vegetables. 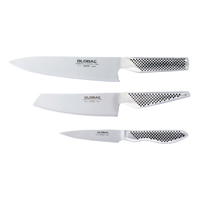 A variety of shapes and syles for slicing and carving. Light and heavy weight carving knives, and matching forks. 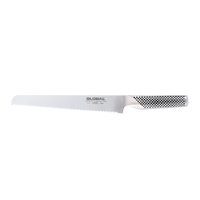 Sandwich knives and other small utility knives for various functions in the kitchen. 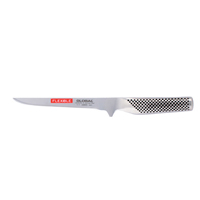 The tapered, pointed blade is designed for working closely around bones and joints. 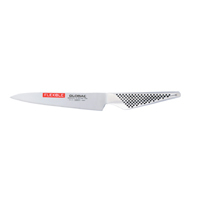 The serrated edge easily slices the crustiest breads. A heavier blade designed to cut through tendon and bone. 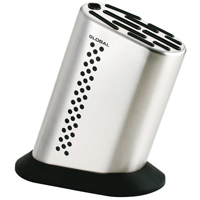 Use in place of your lighter knives to protect them. A Japanese style knife for cutting vegetables. 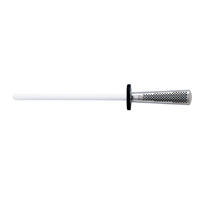 Used for realigning the edges of your knives with each use. 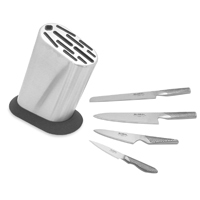 Elegant blocks, wall magnets, and trays to store, protect, and display your Global cutlery.